Jacob van Campen (architect of the City Hall in Amsterdam) designed the Nieuwe Kerk in 1649 after a model of the temple in Jerusalem as it was imagined in the 17th century. This accounts for a specific style characteristic of his building: the inward curved buttresses at the outside. This characteristic is mirrored in the interior in the construction of the pulpitt. More in general the stern walls reflect the sight of a (temple) burrow. 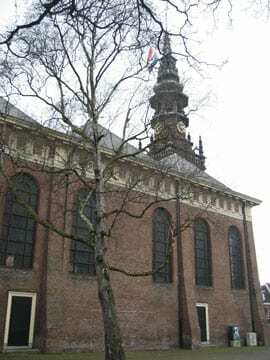 The tower dates from 1613 and was build in the Dutch Renaissance style by the Haarlem City architect Lieven de Key as an annex to the St. Annakerk, previously occupying this place. 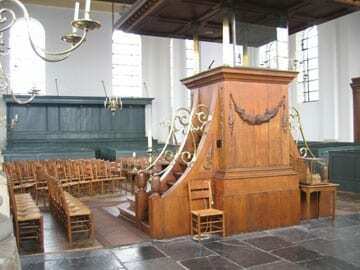 With his design Jacob van Campen alluded to the self-awareness of his Reformed environment. Dutch protestants liked to see themselves as the ‘New Israel’, reborn just like the “Old Israel’ from a struggle for religious independance. 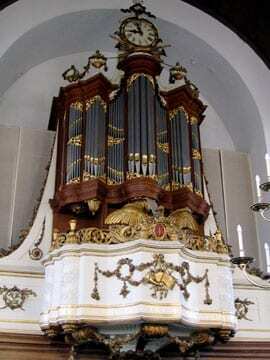 This organ was build by Hendrik Hermanus Hess in 1791, partly with historical material and pipes from the former so-called Zuiderorgel in the Grote of St. Bavokerk.